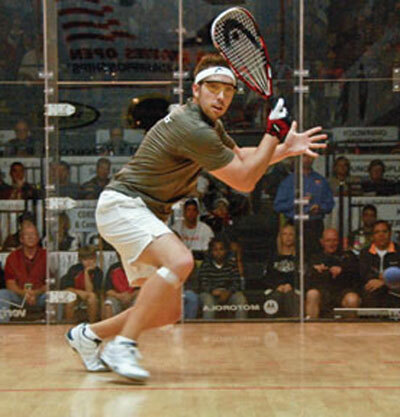 Ashaway, RI — Officials at Ashaway Racket Strings announced today that the company has signed a new two-year sponsorship agreement with well-known Racquetball Pro, Jack Huczek. Under the terms of the agreement—specifics of which were not disclosed—Huczek will continue to support his favored Ashaway Superkill® II string as well as his signature Jack Huczek/AMPS 311M racquetball shoes. In addition, under the new agreement, Huczek will become more involved with Ashaway product development and marketing efforts. The former World Champion is currently ranked Number Two on the IRT, and with a good start to the current season, will certainly be in contention for Number One. He capped off the 2007-08 season winning the Motorola Pro Nationals in Chicago, and already has one tour win this season at the Canadian Racquetball Classic in Edmonton, Canada. Known for his hard work ethic and extreme fitness level, Jack is expected be a continued asset to Ashaway Racket Strings. Ashaway AMPS 311M shoes are designed for serious and recreational racquetball, squash and tennis players who want a dynamic look, ultra comfort, and enhanced performance. Built for speed and traction, the AMPS design incorporates wet-grip rubber outsoles which provide high durability and incredible grip, even on wet surfaces. Ashaway SuperKill II is constructed of a nylon polymer monofilament core covered by an abrasion resistant wear layer, and is noted for its excellent resiliency, durability and resistance to abrasion. The SuperKill family of high performance racquetball strings also includes SuperKill 17, a 17-gauge version offering added playability, and SuperKill XL, a nylon multifilament string with a braided jacket for enhanced spin and ball placement. The strings in this line come in both 40 ft (12 M) sets and 360 ft (110 M) reels. Ashaway Racket Strings are made by Ashaway Line & Twine Mfg. Co., the only U.S. manufacturer of string for squash, tennis, racquetball, and badminton. Operated by the Crandall family since 1824, Ashaway has been making racquet strings since 1949, and is responsible for several important technical innovations. Ashaway is the Official String of USA Racquetball and the Women’s International Squash Players Association. Ashaway Line & Twine Mfg. Co. also makes braided products for medical and industrial applications.